Come along to one of our big events and have fun while you support Amaze. Since 2010, Amaze and our patrons have presented the the hugely popular BIG CHEER for Amaze! 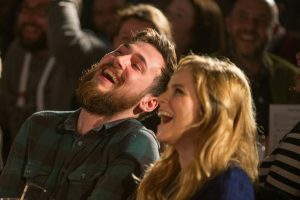 – our stand-up comedy fundraiser – featuring some of the biggest and brightest names in the world of stand up and TV comedy. Previous acts who’ve given their all for the BIG CHEER include Steve Coogan, Jenny Eclair, Noel Fielding, Nick Helm, Phil Jupitus, Joe Lycett, Joe Wilkinson and Angela Barnes. 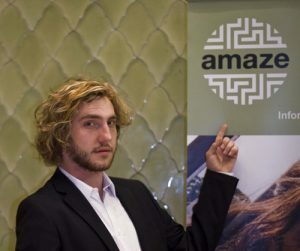 Don’t miss our next BIG Cheer for Amaze in October 2018, which stars Seann Walsh and other yet to be confirmed names. It’s always a sell out, so book tickets now to avoid disappointment! In July 2017, Amaze organised the first Amazing 100 Metre Water Slide down the dramatic slope at Brighton’s beautiful Wild Park. 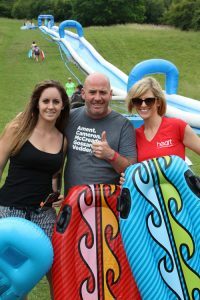 700 riders bought tickets to raise funds for Amaze and came with their families to enjoy the sheer adrenaline rush of speeding down the slide with bubbles, blow up cushions and inflatables. Heart FM radio were there pumping out tunes – watch this great video of their breakfast show presenters Nicola and Jack taking part. The Amaze 100m Water Slide is coming again on Saturday 21st July 2018, venue to be confirmed. Visit our events calendar to find out more. We always need volunteers to help out at these headline events in our calendar. Find out more about volunteering.